Idaho’s rivers access some of the most pristine terrain in all the state. They are home to abundant flora and fauna, an impressive network of hiking trails, and some of the country’s best whitewater. The Salmon River is widely considered to be the crown jewel of Idaho rivers, often compared to the Colorado River through the Grand Canyon. Our Main and Lower Salmon River experience is breathtaking, as it flows through a canyon deeper than the Grand in places. Through the forested depths of the Main Salmon and finally into the four distinct gorges of the Lower Salmon, this trip showcases some of the most breathtaking scenery our country has to offer. Float with us along 165 miles of pristine river canyon and enjoy a natural hot spring, outstanding fishing, big sandy beaches and exciting class III whitewater. It doesn’t get any better than this. We’ll meet at the Holiday Inn Express – The Hunt Lodge in McCall, Idaho at 8:00 PM for a pre-trip orientation. This is an opportunity to meet your fellow travelers and ask any last-minute questions. We will give you a thorough trip orientation, and pass out your waterproof river bags so that you can pack your belongings that evening. We will also confirm the meeting time for the following morning. We’ll depart McCall for a scenic flight to Salmon (approximately 55 minutes). Upon arrival, we will drive approximately 2-hours to our put-in at Corn Creek. Along the way, we’ll stop at the North Fork Store for fishing permits, lures, and any personal odds and ends that you may have forgotten. Reaching the river late morning, we meet the OARS crew and feel our excitement grow as we see the colorful boats waiting for us. After an informative safety talk and some brief paddle raft/inflatable kayak instruction, we’re off on our river adventure! The first day’s whitewater action includes rapids like Killum and Gunbarrel. The surrounding scenery immediately transfixes us, and for the duration of our trip, we’re mesmerized by the beauty of the Salmon River canyon and the 2.3 million-acre Frank Church River of No Return Wilderness. This broad canyon is heavily forested with towering pines and conifers and, early in the season, blanketed with vibrant wildflowers. We may be welcomed to the river by a family of otters swimming near our boats, a herd of bighorn sheep scaling a steep canyon wall, a giant elk or moose wading in the shallows, or if we’re lucky, a black bear standing sentinel on shore. Typically a day on the river includes a few hours on the water in the morning, sometimes stopping for a great hike, a visit to a Native American pictograph, historical site or a soak in a natural hot spring. Come lunchtime, we pull over to a sandy beach and enjoy a delicious picnic. After feasting and relaxing on the beach (or perhaps swimming, a game of Frisbee, a nature walk…), we get back in our boats for more floating and exciting whitewater. Be sure to try your hand at the paddleboat and inflatable kayak! Mid- to late-afternoon, we stop and make camp. You grab your bags and set up your tent while we take care of the kitchen and “living room”—camp chairs and the site for tonight’s campfire (if permitted). Read, nap, or just sit back and laugh with friends and family as we prepare dinner. After a satisfying feast, the evening is yours to spend however you wish. Maybe music, stories, or jokes will bring us together tonight; maybe the popping of the fire, the whisper of the river and the clarity of the big, star-filled sky will encourage silent reflection on the amazing wilderness that is, for now, our home. As we journey into the pristine heart of the Frank Church, each day brings new discoveries: exciting rapids like Salmon Falls, Big Mallard and Growler, historical sites such as Buckskin Bill’s homestead and Jim Moore’s place (maybe you’ll find the fortune he buried in the hillside! ), and the much anticipated Barth Hot Springs. Avid hikers may enjoy a challenging climb to Rabbit Point, where the beautiful views are well worth the effort of getting there. The fishing is excellent during these days, and on trips in July and August, warm air and water temperatures encourage frequent refreshing dips in the river. Our last two days on the Main Salmon parallel the Forest Service road, and we share our river canyon with a gravel road for one day and the highway for a second day—a small concession. There’s a great swimming hole near French Creek, and some of the river’s best rapids, including Ruby, Lake Creek, Lightning Creek, Chair Creek, and Fiddle Creek. We’ve now reached the Lower Salmon River. A significant difference is the water temperature—the river is much warmer here on the Lower, and those of us ready to test it out can swim through Rollercoaster rapid, which marks our entrance to Green Canyon. We’ll stop to visit some ancient pictographs, and then continue our whitewater action with rapids like Wright-way, Demon’s Drop, and Pine Bar rapids. As we float along the river, we’ll keep an eye out for the wildlife that inhabits the canyon. Golden eagles, ospreys, and river otters make frequent appearances; if we’re lucky, we might also see beavers, cougars, and Rocky Mountain bighorn sheep. After Green Canyon come Cougar and Snow Hole canyons, each offering a different perspective on the striking scenery around us. All the while, the river slowly unfolds its long and varied history, providing glimpses of old mining and ranching sites, geological displays of basalt formations, remnants of ancient Indian cultures, and the remains of old Chinese stone houses. Entering Snow Hole Canyon, we face some of the biggest, most exciting whitewater of the Lower Salmon: Half & Half, Snow Hole, and China Bar rapids. Early season boaters can experience the challenge of Slide Rapid in Blue Canyon—perhaps the most spectacular of the four gorges through which we’ve traveled. Hikers in the group might enjoy climbing to a vista point for an impressive bird’s-eye view of the river winding through the steep and slender canyon. Further downstream, as we join the Snake River, we may have the fun of swimming a rapid. After passing through the confluence with the Grande Ronde, we arrive at our take-out, Heller Bar. Our journey has led us through 165 miles of Idaho’s glorious, ever-changing wilderness. Now, a 45-minute ride is all it takes to get back to “civilization,” though we’ve been worlds away during our unforgettable experience on the Salmon River. ☐Consider Purchasing Travel Protection: We recommend the purchase of the OARS Travel Protection Plan to help protect you before and during your trip. A travel protection plan can help with reimbursement of your non-refundable payments in the event you have to cancel your trip due to listed reasons such as a covered illness or injury. Because we begin working to prepare for your trip upon receipt of your deposit and may be turning other prospective guests away while holding space for you, there are cancellation fees that will apply regardless of why or when you might need to cancel. We list the cost for the optional OARS Travel Protection Plan on your trip invoice. If you enrolled in a Trip Mate policy through OARS on or before December 9, 2018, the policy is still in place and will be administered by Trip Mate through the end date of your scheduled travel with OARS. All information provided in regards to the Trip Mate policy remains relevant. For a complete description of your Trip Mate policy, go online to: http://www.tripmate.com/wpF431H or call Trip Mate at 800-888-7292 (reference Plan # F431H). The day before your trip we will meet at 8:00 PM at the Holiday Inn Express – The Hunt Lodge in McCall, Idaho for a pre-trip meeting. Your trip leader will provide a thorough trip orientation and pass out your waterproof bags so that you can pack your belongings that evening. The trip leader will also confirm the meeting time for the following morning and give you an opportunity to ask any last-minute questions. Gem Air offers an air shuttle to McCall, ID for approximately $180*. Boise (BOI) is served by several commercial airlines including United, Delta, Alaska, Southwest, Allegiant, and US Airways. *Some of these flights do require a 3 seat minimum to receive the per seat rate. Usually they do not have a problem filling the seats, but we do want to make sure you are aware. Prices are also subject to change. Please note: When booking your flights, be sure you arrive in McCall the day before your trip starts. You will need to arrive in Boise no later than 3:00 PM as the last flight from Boise to McCall generally departs at 4:30PM. Please mention you are an OARS guest when making your reservation. Prompt Taxi Service provides transport between the McCall Airport and the Holiday Inn Express- The Hunt Lodge. Please call them upon your arrival in McCall to set up a shuttle- (208) 630-3065. On the final day of your trip you will be transported to the town of Lewiston, Idaho between 4:00 and 6:00 PM. Lewiston is served by Delta and Alaska Air. If you choose to fly Delta or Alaska airlines (which fly to both Boise and Lewiston) you may be able to get a flight into Boise at the beginning of your trip and home from Lewiston at the end of your trip, so that you don’t have to return to Boise before flying home. If you do need to return to Boise, Alaska offers flights from Lewiston to Boise for approximately $99*. McCall is 110 miles north of Boise, Idaho, approximately a 2 ½-hour drive. Please note: If you drive, you will need your car transferred from the meeting point in Salmon to the end point in Lewiston. To arrange a car shuttle please contact River Shuttles (1-208-756-4188, www.rivershuttles.com) which will deliver your car to the Red Lion Hotel in Lewiston for your return. If you are planning on renting a car, we recommend you contact Avis (208) 383-3350 or Hertz (208) 383-3100. River Shuttles has an arrangement with these companies and will fax a form to them, which will allow your vehicle to be shuttled. The other rental companies do not have an agreement with River Shuttles. On the final day of your river adventure, you will be returned to the Red Lion Hotel. Weather permitting, you should arrive in time to make connecting flights that depart after 6:30 PM, but we highly recommend you overnight in Lewiston. The special rate for OARS guests, for a double room, starts at $95, depending upon availability. A more economical choice, the Inn America is within walking distance of the Red Lion and offers family suites. Please call them for rates. *Many of the lodges we work with offer special rates for OARS travelers, so be sure to mention you are an OARS guest when making your reservation. Dropping down through the Main and Lower Salmon, you’ll notice a significant difference in the nature of the whitewater as the river widens and increases in volume as we go along. The Class III rapids of the Main and Lower are exciting and challenging, and provide an opportunity for both paddling and relaxation. The pool-and-drop nature of the Main and the Lower Salmon offers time to enjoy the scenery in between rapids, and the increased flows allow you to ride the waves in our whitewater dories. After each active day on the river, we pull ashore to camp for the night. Upon arrival, our first task is to unload the boats using a fire line of crew and passengers to expedite the process. Individuals then collect their waterproof bags and locate an area on the beach to camp for the night. On the first night in camp, a crew member will give a demonstration on setting up a tent, which you’ll see is quick and easy. The guides will set up the kitchen and central dining/seating area with camp chairs. They will also locate a secluded area away from camp to set up the portable toilet, where privacy is assured. The meals we serve are hearty and delicious, complete with fresh ingredients and a variety of foods. A typical morning on a multi-day trip might start with French toast, bacon, fruit, orange juice, and coffee or tea. Lunch might be a delicious spread of cold cuts and cheeses with several types of bread, or pitas stuffed with veggies and hummus. There are always cookies and a cooling drink to top it off. At dinner, our guides’ cooking skills truly shine—sizzling steaks or salmon, chicken enchiladas, and delicious pasta dishes are all part of their repertoire. Dinner generally includes hors d’oeuvres, a salad, and desserts are frequent. Due to the constraints of cooking for a large group, availability of ingredients in remote locations and limited packing space, we are unable to cater to dietary preferences (likes or dislikes). We provide a limited supply of sodas per person per day, water, lemonade and a limited supply of beer and wine with dinner. You are welcome to bring your own favorite beverages, alcoholic or non-alcoholic, in non-glass containers. If you choose to bring additional drinks or alcoholic beverages, please let us know in advance. For those planning to buy hard liquor in Idaho, State Liquor Store hours vary. For information on where you can buy liquor in Idaho, please visit: http://www.mixblendenjoy.com/. Selection is likely to be limited. For your safety and the safety of others, the consumption of alcoholic beverages is limited to camp. One highlight of the Main & Lower Salmon is that the river’s currents and water levels allow us to bring a wide variety of boats. That means that you may experience every vessel we have to offer, conditions permitting! Please indicate any boat preference on your guest registration form in the field for listing your expectations. The Salmon has many great hiking trails. While we generally plan at least two guided hikes on each trip, there is ample opportunity for the curious to explore the area at length. Please let your trip leader know if you are an avid hiker, and remember to bring extra water bottles and good shoes. Remember however, that all hikes are optional and you can choose to lie on the beach and take in a few tanning rays or read a book instead. The Salmon River is renowned for its trout fishery. To protect the resource, all fishing is limited to catch and release, with single barbless hooks. No bait is allowed. Our guides will be happy to explain proper handling techniques for catch-and-release fishing, if you are not already familiar with them. You can also fish for smallmouth bass and, in the fall, steelhead. You’ll need to bring your own gear. We recommend collapsible poles for ease in packing, light spinning tackle with 4- to 6-pound test, and an assortment of spinning lures such as Mepps, Rooster tails, and Super-dupers. Please bring your rod protected in a hard case. Fly anglers do quite well, especially in major tributaries. Non-residents of Idaho can buy a short-term fishing license by calling 1-800-635-7820. You can also purchase one online at www.fishandgame.idaho.gov and https://id.outdoorcentral.us. Anyone 14 years and over needs to have a fishing license. Children under 14 years do not need to buy a license, but they must be accompanied by an adult from their party with a valid license. For more information, ask us to send you our flyer on fishing in Idaho. Bathing is not allowed in the river or in any of the side streams that feed into the rivers. You may want to bring a solar shower or you can borrow a bailing bucket from one of the rafts to rinse off after soaping up. Both are to be used at least 200 feet away from the water source in an area that will absorb the runoff. We recommend using a liquid biodegradable soap such as Campsuds or Dr. Bronner’s www.drbronner.com which can be purchased in most stores that have a camping section and can also be used to wash clothes. You may also find a good selection at your local health food store. Disposable anti-bacterial towelettes (Coleman Swash Cloths, baby wipes, etc.) can also be purchased and are especially convenient for spring and fall trips. Once you are on the river there is limited communication with the “outside world.” Cell phone service is not available. Our guides carry satellite phones which are strictly used to call out in case of an emergency situation on the river. They can call out, but we cannot call them. Periodically the trip leader will check in with our office. If you have someone that needs to contact you about an emergency at home, they should call our office (800-346-6277). If possible, we will relay the message to you. Keep in mind however, it could be several days or longer before the message actually reaches you. For your family at home you should define for them what you consider an emergency and provide them with instructions to call our office in the event one occurs during your vacation. You may want to check one week prior to your trip for an up-to-date weather forecast. We recommend the following website: www.wunderground.com for weather in McCall and Lewiston, Idaho. In camp—When the weather is cool or cold, you’ll want a non-cotton beanie-style hat to wear in camp. They are the perfect remedy for bed-head as you rise from your sleeping bag to secure your morning cup of coffee or tea, or for retaining warmth in the evening hours after the sun sets. During summer months, conditions on the river may be hot and sunny. These trips require less gear than spring or fall trips, but thoughtful packing is still required. Protection from the sun and heat will be critical to your enjoyment and health while on the river. and during side hikes. To protect yourself from the sun’s rays, consider bringing long-sleeved shirts and pants. Synthetic or merino wool long underwear is a must-have on river trips. It can be worn under shorts, rain gear, T-shirts, etc., then stripped off when the chill of the morning has worn off. It keeps you warm even if it’s wet (which can happen easily), dries quickly, and it’s compact enough to be stuffed into your small waterproof bag or daypack after you take it off. It can be layered under your waterproof rain jacket and pants. In cooler weather a rain jacket and pants work better than a wetsuit, because the jacket and pants can be put on when it’s cold, or when you’re going through whitewater, then easily taken off when the sun comes out and it’s hot. Some folks find that wetsuits don’t work as well as they are tedious to put on and take off. During early season or high-water trips we do provide wetsuits for paddlers. Be aware that cotton items, once wet, do not insulate; only synthetic and wool materials will keep you warm during cool, wet weather. Bugs and mosquitos vary depending on location and time of year. It’s a good idea to come prepared with insect repellent. Long sleeved shirts and pants may be desirable at times. Occasionally on a very hot, dry year there are yellow jackets present. If you are allergic, please bring an epi pen. We supply a professionally laundered sleeping bag with liner, a pillow with freshly laundered pillowcase, sleeping pad, ground tarp as well as a shared tent. The complete customized sleep kit that we provide is designed for your comfort and maximizes available luggage space. Our sleeping bags are degree rated depending on the season and are 33” x 84,” which is longer than the normal 80”. Find all the gear you need for your trip online in the OARStore (http://oars.newheadingsllc.com/) and receive FREE SHIPPING in the U.S. + 15% of your purchase helps provide disadvantaged youth with outdoor adventure experiences. At the pre-trip meeting each person will be given two large waterproof bags (approximate sealed size: 13″ diameter x 25″ tall). One bag will be for your clothing and personal items; the other bag will be for your sleeping gear (sleeping bag, sleeping pad, ground tarp, sheet and pillow). These two bags will be your “checked luggage” and will only be accessible in camp. Tents are stowed separately. Please note: your sleeping gear will come already packed in one of the two waterproof bags. We also provide a small waterproof bag for day use where you can keep items such as raingear, camera, sunscreen, lip balm, etc. (approximate sealed size: 17” tall x 9” diameter). The bags are cylindrical in shape and pack from the top. Please pack light, and keep in mind that river attire is casual: comfort, convenience and boat space take precedence over style. At the end of the trip, you will return to Lewiston with your waterproof bags, where you will be able to unpack your gear before your trip home. Please note: You are limited by Gem Air to 35 pounds of baggage per person. Baggage handling on the small aircraft is made much easier if your luggage is soft-sided. We recommend you take on the river only what’s absolutely necessary. Keeping gear to a minimum ensures it will fit into the waterproof bags we supply and reduces unnecessary packing and unpacking in camp. If you do have extra baggage, we can have a limited amount transported to meet you after your trip, but we assume no responsibility for loss or damage. 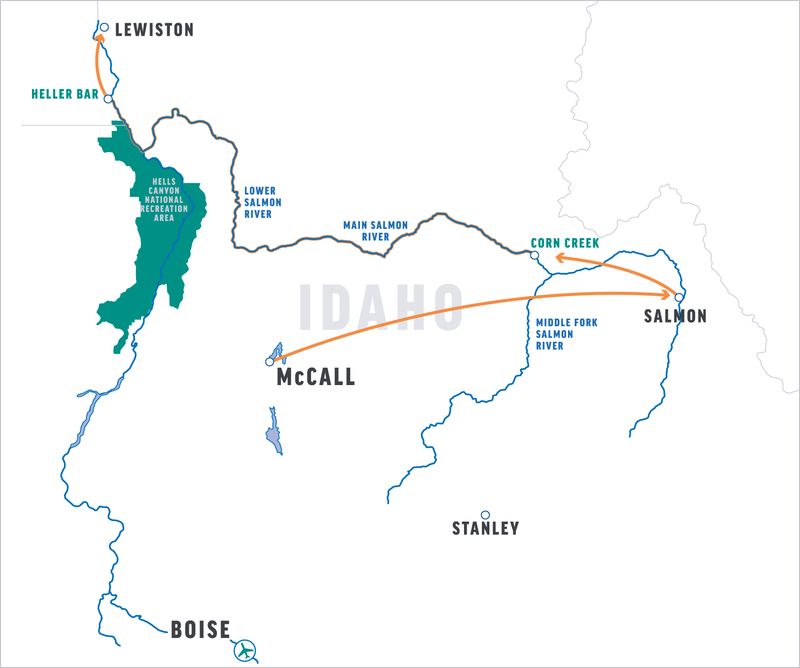 In reviewing your statement, you’ll note a $1/person/day donation to Idaho Rivers United, a non-profit conservation organization dedicated to defending Idaho’s free-flowing rivers. One-hundred percent of these funds go directly to the river protection work of IRU, and your contribution is tax-deductible. Please notify our office if you would prefer to delete the donation from your balance. A $800/person deposit is required at the time of reservation. The balance is due 90 days prior to departure. Everyone is required to sign a standard liability release (or Acknowledgement of Risk) form before the trip, acknowledging awareness that there are inherent risks due to the nature of the activities, a condition of your participation is that you will sign this form and return it to our office before the trip begins. Anyone who refuses to sign the form will not be allowed to participate, and consistent with O.A.R.S. Dories, Inc. cancellation policy, there will be no refund of the trip fees at that time. O.A.R.S. Dories, Inc. and cooperating agencies act only in the capacity of agent for the participants in all matters relating to transportation and/or all other related travel services, and assume no responsibility however caused for injury, loss or damage to person or property in connection with any service, including but not limited to that resulting directly or indirectly from acts of God, detention, annoyance, delays and expenses arising from quarantine, strikes, theft, pilferage, force majeure, failure of any means of conveyance to arrive or depart as scheduled, civil disturbances, government restrictions or regulations, and discrepancies or change in transit over which it has no control. Reasonable changes in itinerary may be made where deemed advisable for the comfort and well being of the participants, including cancellation due to water fluctuation, insufficient bookings (this trip requires a minimum of 4 guests), and other factors. There is risk in whitewater rafting, particularly during high-water conditions. Rafts, dories and kayaks do capsize. You could be swept overboard. Your guide will make every attempt to assist, but you must be strong and agile enough to “self-help” and “float-it-out” without further endangering yourself or others. We reserve the right not to accept passengers weighing more than 260 pounds or with a waist/chest size exceeding 56 inches. We may decide, at any time, to exclude any person or group for any reason we feel is related to the safety of our trips. We are experienced at accommodating people with various disabilities. Please give us an opportunity to make you feel welcome. We need to discuss any special requirements ahead of time. On advancement of deposit the depositor agrees to be bound by the above recited terms and conditions. Prices subject to change without notice.